With the warm weather we have been experiencing here in Southern California, you would think it’s the middle of summer, not six weeks until Christmas! But, it is, indeed, the middle of November, which means it’s time for KatieJ Photography’s annual holiday portrait mini-sessions! 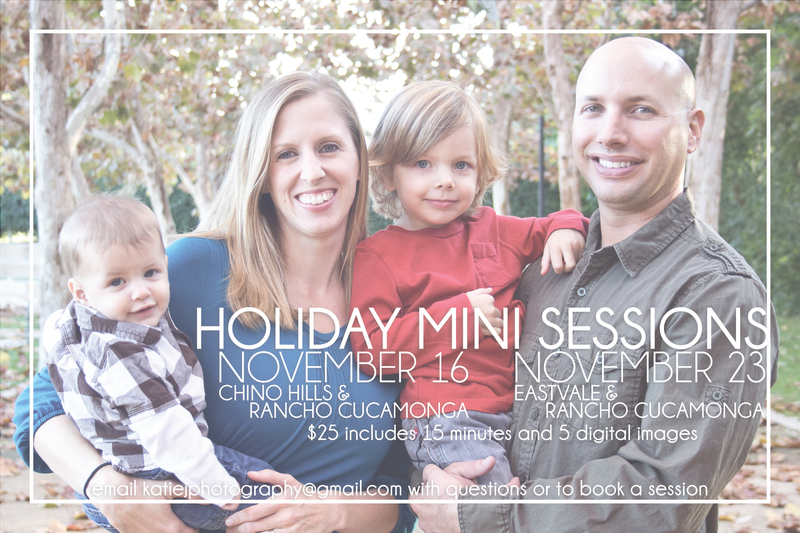 Whether you need photos for your annual holiday cards, a new family photo for your wall, or a gift to send to Grandma, these quick sessions are a great way to get a few photos of your family while experiencing what KatieJ Photography is all about. I have several dates and locations to choose from – including several new locations! Be sure to contact me at katiejphotography@gmail.com to book your session soon as they fill quickly! I look forward to seeing you and your family at one of my sessions this month!